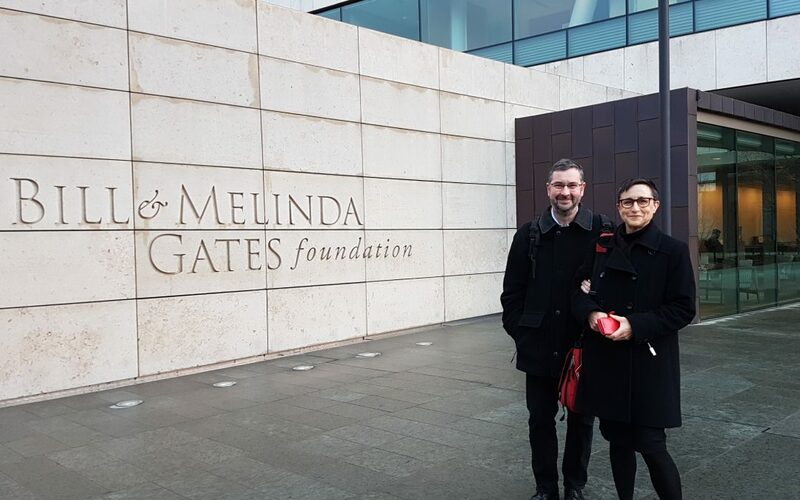 When staff from the Bill & Melinda Gates Foundation invited us to Seattle in November to talk about our work in surveillance systems, we squealed with delight, jumped up and down and have probably been glowing ever since. Finally, an opportunity to sing and dance about what we have been so dedicated to over the last few years. It felt good to be recognised for the success of iSIKHNAS and the hard work and passion from a small and dedicated team. iSIKHNAS has changed the face of disease surveillance and our ability to respond to threats forever and we couldn’t wait for the opportunity to show someone how it worked and the thinking behind it. We were particularly thrilled at the prospect of having an audience of people committed to learning from innovative approaches and building large-scale projects to tackling major health challenges facing the most vulnerable. But what brought about the invitation to Seattle? We definitely have Marisa Peyre from CIRAD (The French agricultural research and international cooperation organisation) to thank! Marisa has long been an admirer of the system in Indonesia and has recently been very involved with research into Public Private Partnerships through an OIE/Gates led project. iSIKHNAS has been one of the case studies of the project and as a participant in a Gates funded project, Marisa was invited to the Grand Challenges Annual Meeting, in Berlin in October, 2018 (together with about a thousand other grantees). She was also asked to bring a specialist in animal health surveillance along with her!! Marisa thought of Ausvet, Angus, and iSIKHNAS! By very good fortune, Gates Foundation project staff attending the conference happened to see a couple of 10-minute impromptu “marketplace” presentations Angus and Marisa gave separately and were obviously impressed. They extended a formal invitation a few days later to us (Angus and Cate) to come and present Ausvet’s portfolio of work in innovative field-data collection techniques, integrated data platform design and user-focused, service driven information systems in person at the Foundation headquarters in Seattle. It was a precious opportunity to showcase the development and success of iSIKHNAS and the philosophy and technology behind it. We initally thought we would have only a few hours with staff but as the visit drew closer the list of meetings and presentations planned for us developed into a very full three-day schedule of working lunch presentations, cross-sectoral meetings, country-specific program meetings and gave us multiple opportunities to really chew over the complexities of the system, questions of replicability, and the many factors behind its success. We dedicated lots of time and energy to preparing clear communication messages and lots of concrete illustrative examples of some of the most important features of both iSIKHNAS and our Omnisyan approach. The visit was a fantastic opportunity to talk over all the aspects of such a complex system and our vision for extending it throughout Africa and Asia with people who aren’t afraid to think big. Marisa partnered with us throughout the visit and we had the pleasure of talking to people from a range of teams working in human, animal and plant health throughout the Gates target countries. The Foundation is a fantastically well-designed, well-appointed working environment and it attracts really perceptive, talented and experienced people to their teams. It was fascinating to see them at work. They craft ideas, pull together innovations and bring different a stimulating range of experience and knowledge into the conversations. We are happy to report that we really stepped up to the communication challenge and had a fantastic reception from everyone we met. We were so keen to do credit to this game-changing approach to disease surveillance and stakeholder engagement and get it noticed by such a strongly influential actor. We see great opportunities ahead for the development of such systems, regional approaches to sharing resources to support them and the massive impact they can have on planning and monitoring health outcomes at many different levels. We look forward to giving you an update on where this wonderful opportunity takes us.